The Communist Party USA will reach its centennial anniversary in 2019, but comrades and friends in New York got a head start recently. A program featuring song, poetry and a dramatic presentation at its offices on 23rd Street drew a diverse and engaged crowd of supporters. The New York District marked the occasion by naming the office the Winston Unity Center in honor of the Party’s late National Chair Henry Winston. Current New York State Chair Jarvis Tyner emphasized in his remarks the importance of Winston’s lifetime contributions and work for the Party and for the country generally. He recalled that Winston had been one of the Party leaders who served years in federal prison on trumped up Smith Act charges and that the authorities’ lack of attention to Winston’s health had caused the nearly complete loss of his vision. He also noted that it had been President John Kennedy who, as a result of the activity of the Party and its supporters and legal representatives, had commuted Winston’s sentence and ordered him freed in 1961. The program included musical presentations by guitarist/vocalists David Laibman and Ricky Eisenberg, poetry by Chris Butters, presentations by Vinie Burrows and fast food activist Rynetha Benjnet, a dramatic reading of a 1949 speech of NY Communist City Council member Vito Marcantonio, as well as the smooth sounds of DJ Poliarity. The event was chaired by Esther Moroze and Sara of the YCL. New York District Organizer Estevan Bassett-Nembhard spoke about the CPUSA’s long and impressive record of contributions to the people’s struggles from the pioneering efforts against Jim Crow and lynching during the decade of the 1930s, through the struggle to organize workers in America’s basic industries during the ‘30s and ‘40s, the Civil Rights Movement and more. 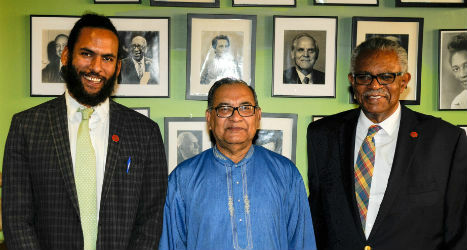 The day had additional significance due the presence a distinguished international guest, Mujahidul Islam Salim, the President of the Communist Party of Bangladesh.